In the 16 years that have passed since the tragic death of Tupac Amaru Shakur, the world has changed a lot. However the topics discussed in much of Tupac's music remains very relevant, and in many cases, even more intense than in the days which he wrote the lyrics. Tupac changed not only the face of music, but of thinking. Tupac opened people's minds and reminded them that they must be true to themselves & stand up for what counts, regardless of the outcome. Tupac's songs such as Keep Ya Head Up, Brenda's Got A Baby and Dear Mama showed his softer side, in touch with the struggles of single mothers. While his harder songs, such as Ambitionz As A Ridah, If My Homie Calls and When We Ride On Our Enemies, show the reality of survival in this cold world. Tupac is a man who inspired many people (myself included) and his music will live on throughout the years to come. As long as hip hop is being heard, Tupac's music & message will also continue to be heard. And his lyrics will continue to open the minds of young, poor & oppressed. His voice is now our voice and will continue to echo through the walls of time. 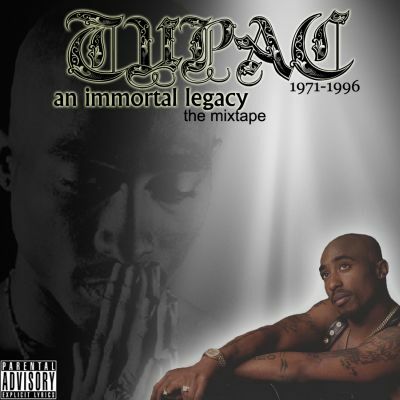 So, in memory of not only one of the greatest rappers, but one of the greatest modern-day poets & political activists, I am producing a mixtape dedicated to Tupac's legacy. This mixtape will not only feature some of his greatest releases, but will also combine news clips & interviews along with some mixes to showcase his music as well as his message. So stay tuned to djdiamonddog.com & witness the release of a classic, which will be released at some point this summer. The official release of Summer Heat 2012 is here! And it is complete with some of the hottest tracks for the summer. 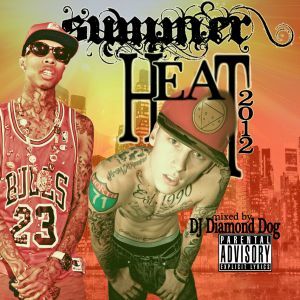 Summer Heat 2012 contains some of the hottest artists out right now, such as Nicki Minaj, Tyga, & T.I. as well as some great new artists such as Hopsin, Machine Gun Kelly, Cracc, & more!! As always, the full mixtape is packed with non-stop music & great samples, flowing straight from beginning to end and encoded at a high quality 192 kb/sec. This year's edition also comes with 2 versions... one designed to be burned to cd (with a length of 79 minutes) and one for use in an ipod or other mp3 player (with a length of 100 minutes & 9 bonus tracks). Feel free to sample the entire mixtape online and download either or both copies for your computer, ipod or cd player. The 2012 edition of Summer Heat is coming strong with with both popular, established artists (such as Nicki Minaj, T.I. & DMX) as well as new artists who are also bringing the heat (such as Hopsin, Machine Gun Kelly, Cracc & Mac Miller). Summer Heat 2012 also comes in 2 versions... the cd version (which was recorded specifically to be burned to disc at 79 minutes long) and the ipod version (which is almost 100 minutes in length & contains 9 bonus tracks). Summer Heat 2012 brings out a few songs that have already gone mainstream, such as Starships by Nicki Minaj & So Good by B.o.B. There are also some ppular cuts with a twist including Chris Brown's Turn Up The Music featuring a verse by Drake as well as Rihanna's Birthday Cake featuring a verse from Busta Rhymes. There are also many more tracks from mainstream artists such as Melanie Fiona, T.I., Wacka Flocka Flame, Wiz Khalifa, DMX & more!! The underground flava of Summer Heat 2012 brings out some great new talent. Hopsin (who was in an episode of That's So Raven in 2002) is probably one of the hottest new artists out, making his name through the use of various uplouaded videos to YouTube. Cleveland's own Machine Gun Kelly has recently gained moderate popularity with his release of Wild Boy featuring Wacka Flocka Flame. He has since recorded tracks with DMX & Cassie. Atlanta's newest artist on the table is Future, who has several new tracks out now & has been recognized (along with Hopsin & MGK) as one of 2012's top freshman artists. So be sure to sample & download the version of Summer Heat 2012 that best fits your needs, either the ipod version or the cd version. Both are recorded at a cd quality 192 kb/min & will sound great on headphones or big systems. Thanks, everyone for your support!! I hope this year's edition of Summer Heat meets and exceeds all expectations & remains in your cd deck or ipod well into late summer & early fall!! Be sure to drop me any feedback here or at djdiamonddog.com! !